Our Own Solar System - True-scale Solar System exhibits. Reveal the true proportions of our Solar System. True-to-scale. They provide an accurate impression of the sizes, proportions, and distances of objects in our Solar System. Highly-detailed. Two-dimensional diagrams offer several advantages, including the ability to show many more Solar System objects than 3-D models. Instructive. They advance understanding and promote scientific literacy by correcting common misconceptions about the Solar System. Interactive. Using the included smartphone codes, viewers can quickly find answers to questions they may have about any Solar System object. Walkable. 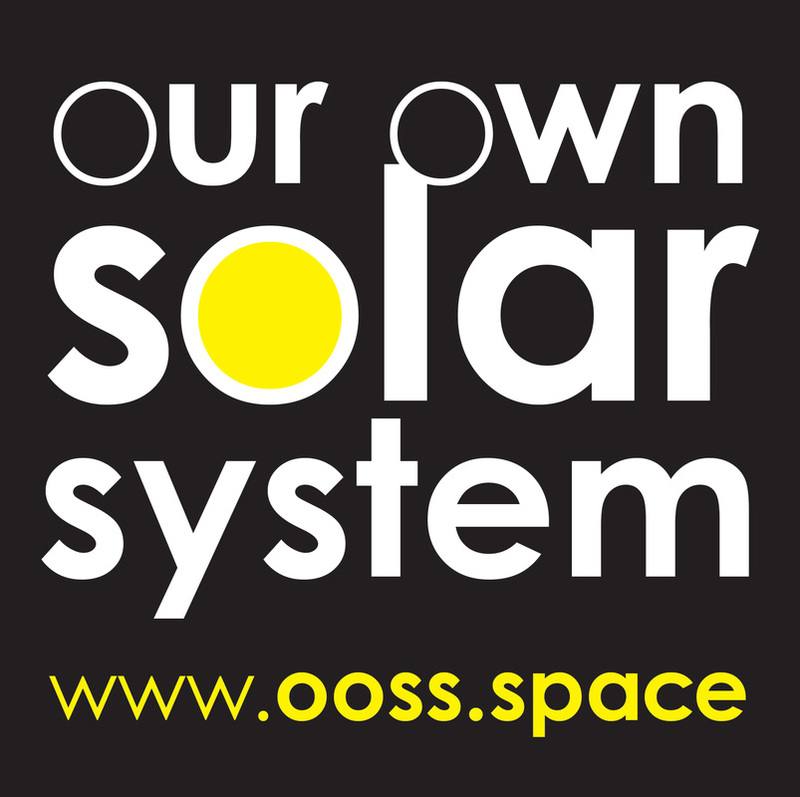 OOSS models are perfectly-sized: large enough that the smallest planets are visible, yet small enough to easily walk from the Sun to the outer Solar System and back. Affordable. They are less susceptible to damage than 3-D models, and (if it should ever become necessary) replacing a 2-D panel is much easier and more cost-effective than replacing a component in a 3-D model. The portable version is intended for educators, or anyone who wants to accurately and compellingly demonstrate a true-scale visualization of our Solar System. The permanent installation is intended for civic organizations, museums, universities, etc. that wish to promote community-wide scientific understanding and exploration. What is a true-scale exhibit of the Solar System? Think of a map. When we want to illustrate something big (like a city or a state), we shrink it down proportionally until it fits onto a piece of paper, or a computer screen. This allows us to view a representation of the entire geographic area, and to comprehend how to get from one point to another. Good maps are drawn to scale, which means that a certain distance on the map (like one inch) corresponds to a certain distance on the ground (like one mile). Maps can be thought of as two-dimensional scale diagrams of a particular geographic area. Obviously, the Solar System is much larger than any city or state. But it too can be reduced enough for us to understand the size of each planet compared to the Sun, and how far away from the Sun each planet orbits. OOSS exhibits are true-to-scale, which means the sizes, distances, and proportions of all objects are correct in relation to each other. However, unlike a city or state, it is not useful to reduce the Solar System so much that it fits onto a piece of paper, because then the Sun and the planets would be microscopically small. In fact, reducing the Solar System to the size of a classroom, or even a whole building, is still too small. So how much room is required for a true-scale diagram of the Solar System? What is a walkable Solar System model? No textbook is large enough to accurately illustrate the Solar System’s distances and proportions. Neither can the Solar System be accurately depicted within the confines of a classroom. In fact, most buildings are not even large enough. In order for a Solar System diagram to be useful, the smallest planet should be large enough that it is visible to the unaided eye. So, if we make Mercury the size of a pinhead, then the Sun would be about the size of a basketball. And if the Sun is the size of a basketball, then the orbit of Neptune is about one-half mile away. Therefore, in order to accurately illustrate the distances and proportions of the Solar System, a space of at least one-half mile in length is required. So a true-scale diagram will almost always need to be demonstrated in an outdoor location. Of course, a longer distance would allow the planets to be made larger, and indeed some Solar System models have been built at scales that are bikeable or driveable. However, a scale of that distance severely restricts accessibility for some users. A walkable scale is simply the best way for the maximum number of viewers to gain a mental and physical appreciation for the true distances between the Sun and the planets. What is a highly-detailed model of the Solar System? Our Solar System contains many more objects than just the Sun and its eight planets. In fact, did you know that two of the moons in our solar system are larger than the planet Mercury? Accurate Solar System models must include more than just the planets. OOSS exhibits include or mention all planetary-mass objects out to the orbit of Neptune, plus several of the known planemos in the Kuiper Belt. The Sun and the eight planets. The five officially-recognized dwarf planets, including Pluto. The twenty largest natural satellites, including our Moon. The four largest asteroids, including Ceres. ​Also, since all planets have elliptical (non-circular) orbits, their distance from the Sun varies. OOSS diagrams illustrate not only each planet’s semi-major axis (its average distance from the Sun), but also its perihelion (closest point), and its aphelion (farthest point). All of this means that, compared to most other physical models of the solar system, OOSS exhibits contain a much greater level of detail. 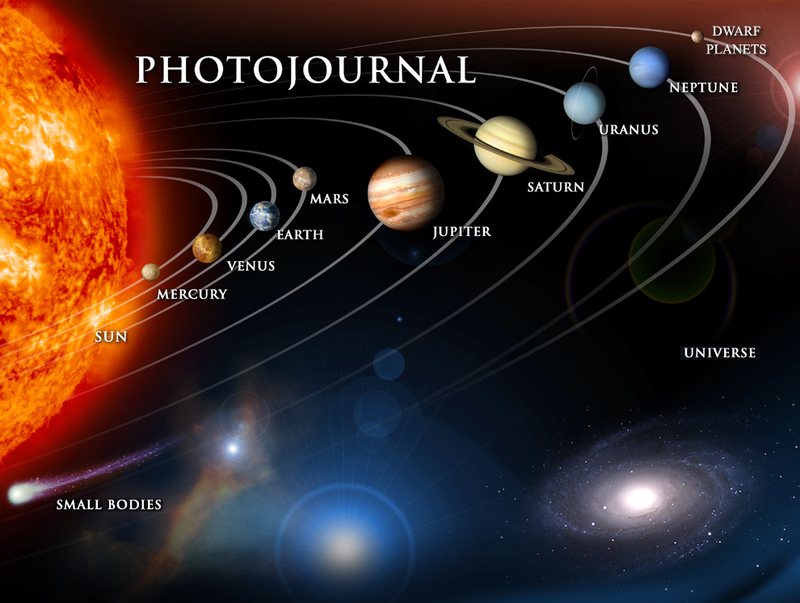 How can a Solar System model promote scientific literacy? Most of us have a very inaccurate mental impression of the sizes, scales, proportions, and distances in the Solar System. Images like this are successful at conveying the idea that the planets orbit in concentric circles around the Sun. Despite being essentially correct on that point, these images are quite misleading in other ways. In the example above, the Sun and planets are not represented at a consistent scale. Moreover, the orbital distances shown there are off by a much greater degree. For example: take the diameter of the Sun, and multiply that by 40. That’s about how far from the Sun Mercury really orbits. And that is only the innermost planet; the orbital distance of the outermost planet (Neptune) is about 3200 times the diameter of the Sun. Granted, misleading images like this are unavoidable, because illustrators have to employ significant artistic license in order to make the Solar System fit into a limited space. But how can the resulting misconceptions be corrected? The best way to convey the true scale of the Solar System is to demonstrate using an exhibit where there is plenty of space... at least a half-mile worth of space. In what way are OOSS exhibits interactive? Our Own Solar System exhibits consist of several physical panels, but they also include an online component. About half of the panels include smart phone codes, each of which links to a corresponding web page. These pages capture interest by first highlighting some of the most awe-inspiring imagery obtained by NASA space probes. Next are a few interesting facts about each Solar System object, followed up with links for viewers who want more detailed information. This makes it convenient to quickly look up the answers to any questions that may arise during a demonstration of the Solar System. Introduction smartphone codes are for the benefit of people who wish to understand more about the general concept of the exhibit (example). Several different QR codes link to interesting facts about individual Solar System objects (as an example, here is the Saturn page). Some of these pages provide information about Trans-Neptunian objects that are not otherwise shown in the exhibit (example). Permanent installations additionally include site-specific smartphone codes, which link to unique information about your community’s customized OOSS exhibit. Included is a description of how much farther beyond our Solar System someone would have to travel in order to reach the nearest star (example of a site-specific page for an OOSS exhibit).